Where to buy "Roundup" for lawn? I am in the process of replanting the grass in my lawn. As advised by experienced members in these forums, I would like to use the product called "Roundup", made by Monsanto, to kill the remnants of the old grass that I am trying to replace. Could anybody here tell me where I could buy it? I live in Lahore (Garden Town) and would prefer to buy it from an Authorized Dealer (or a reliable source) to ensure that the product is genuine. Re: Where to buy "Roundup" for lawn? Were you able to get? if not how you managed. Roundup is a tradename of Monsanto as you have pointed out. The active ingredient is glyphosate, which is available under several brands. The brand I use is "Agent" which is marketed by UDL Pakistan. However, be careful as it is toxic to both humans and plants which we want to keep! If you use Agent to kill remnants of old grass wont it kill the newly planted grass? How long the effect lasts in the soil? Muhammad Arif Khan wrote: How long the effect lasts in the soil? I used Monsanto's Roundup few weeks back to kill weeds growing in vegi garden in the backyard of my home in Okara, and after carpet spray, best I was advised was to wait 6 or 7 days, although it doesn't effect soil at all that's why it is useless against seeds that are in ground and yet to germinate, but wait is for to give time to reach product right into main roots/bulbs of weed/grass etc., and after spray you will see weeds/plants turning yellow and dry up, don't burn the field or disturb the soil at all because objective is to kill the weeds/plants right to their roots! also before using it let your grass/weed/plants grow it at least 8+ inch height. 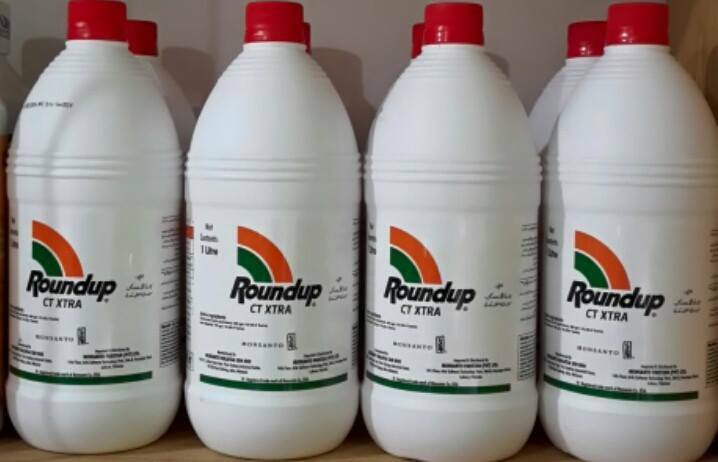 Roundup in Pakistan is made in Malaysia, its even packaged and labeled in Urdu there, Monsanto in Pakistan is only importing it, source: Monsanto Punjab's regional head is my neighbor. Its retailed around 800 and easily available in major pesticide stores. Muhammad Arif Khan wrote: If you use Agent to kill remnants of old grass wont it kill the newly planted grass? Yes of course!! actually I destroyed couple of my plants accidentally with only just a little bit of spray that light wind carried it to them use it with extreme care!! It is clear you have fully taken over. Monsanto the company has destroyed small farmers across the world. I would have a principled disagreement using its products or advising them. You can watch food inc. (documentary) and many others to know more about them. Muhammad Arif Khan wrote: It is clear you have fully taken over. talha.bin.ayub wrote: Monsanto the company has destroyed small farmers across the world. I would have a principled disagreement using its products or advising them. You can watch food inc. (documentary) and many others to know more about them. Well Talha I have seen this documentary and many other, the thing I have learned so far is that GMO is just another new advancement and far from perfect, just like the existing ones in mainstream. I believe every new technological development comes with its unique set of problems and solutions, same way GMO presents solutions and problems that are exclusive to it. And as you know Pesticide industry is in direct conflict with GMOs, that's why they exploit GMO's problem to maximum since billions of dollars $$ are at stake. So I don't judge Monsanto any more, sure they have their share of evil management blunders but look at closely to evils of Nestle! I respect your opinion. But Monsanto seed planted or accidentally entering a field makes the whole crop ownership shift from tenant to Monsanto. That's quite a bit more than management blunders.